Bob the super dog - ZineWiki - the history and culture of zines, independent media and the small press. 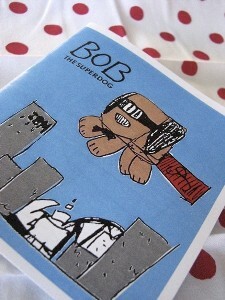 Bob the super dog (2007) is a one-shot zine published by Dudley Redhead (Tara) in Sydney, NSW. The zine is the story of Bob, drawn by the author's nine-year old daughter, who tracks down the cat Milk Whiskers who is wanted for questioning by the police following the robbery of milk. This page was last modified on 20 December 2007, at 22:21.